Earlier in January, we heard rumors that Apple is gearing up to launch a device called the iPhone X Plus, that would feature a 6.5-inch display and 4GB of RAM. 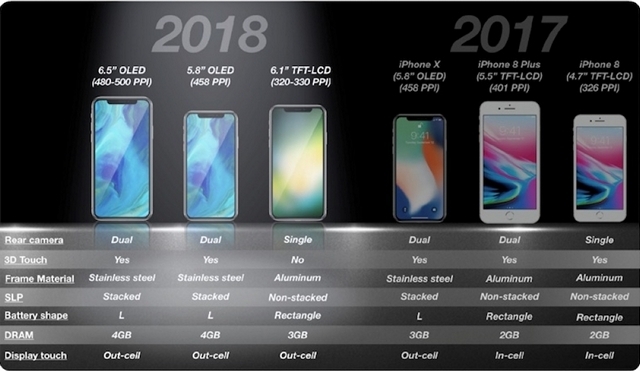 Moreover, the device was tipped to pack a dual-cell 3,300-3,400 mAh battery, which will be roughly 25 percent larger than the 2nd-gen iPhone X, and might have the same footprint as the iPhone 8 Plus. We now have some more information about the iPhone X Plus, which has been spotted in the latest iOS 12 beta’s PassKitUIFoundation by iOS developer, Guilherme Rambo. Buried in the latest iOS 12 beta’s code are line drawings or an iconographic representation of the company’s widely rumored iPhone X Plus, alongside what appears to be a squarish iPad. As per Rambo, the alleged iPhone X Plus diagram is labeled ‘Payment glyph’, alongside another diagram of a smaller device which seems to be the second generation iPhone X and an iPad design render which has a weird square build. But before you jump to any conclusion, do keep in mind that these icons are just early renders and are far from a concrete proof of the existence of an iPhone X Plus. However, the source of the new leak suggests that there is a chance that an iPhone X Plus might be on the development table at Apple, because the design of the original iPhone X and it’s face unlock technology was spotted before its launch in the firmware files of Apple’s HomePod smart speaker. As for the ‘square’ iPad spotted in the iOS 12 beta’s code, Rambo pointed out in another tweet that the iPad icon could be intended to be used with resizeable insets, which means it’s dimensions are adjustable. So, the possibilities of Apple launching a square iPad appear to slim at best.